What happens at a Go Kids Go! Birthday party? Fun, party packages available from only €14.50 including food and party bag. 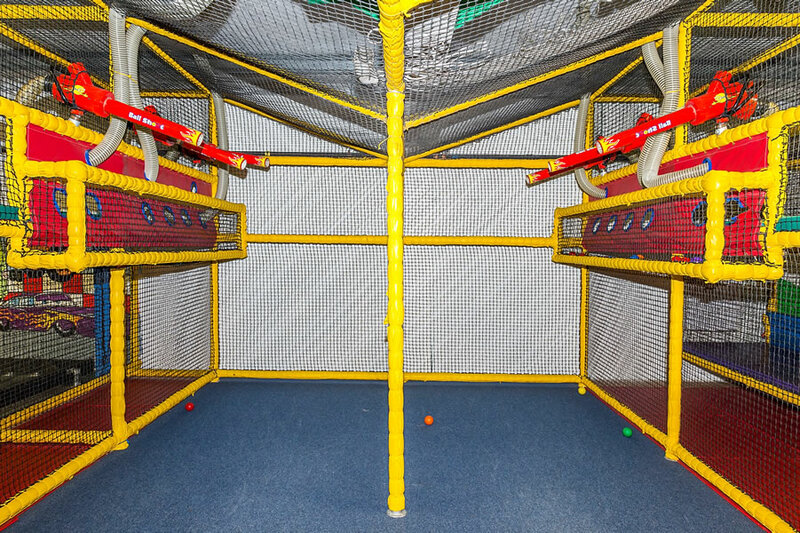 Indoor play centre with activities including laser, go-karting, indoor football and a disco party room. All areas are furnished with padded mats for additional safety, and anti-climb netting for a secure play environment. Entry and exit into the area is gained using electronically controlled access gates. Fantastic venue for parties and also a great indoor play centre. The children play on all the indoor adventure equipment - numerous slides, ball pools, tunnels, rope bridges etc for 90 minutes, then they are called to the specially themed private party room (choice of 4 different rooms available) for 30 minutes. The birthday cake ( supplied by parents) is presented, we sing Happy Birthday and there is a chance for parents to take pictures & video. Friday - Sunday €15.50 per child. Everything included - just bring the cake and your invited guests! Music, dancing and lots more too!! Admission only €5.00 per child before 12.30pm and includes first tea or regular coffee complimentary with admission. Adults & non-walkers are free! We are a great indoor activity centre located in Blanchardstown Dublin 15.You don’t have to worry about the weather! Overall aim for the day is to provide students with learning opportunities through a diverse range of physical activity while developing a number of different fundamental motor and social skills. Ultimately we want students to associate positive emotions with physical activity and movement, leading to a lifelong positive attitude towards physical activity. 3 levels of interactive play equipment - including slides, ball pools, rope climbs, hopscotch etc. Where children can develop their skills in touch, sight and exercise. The tour is 2.5 hours long. It includes 90 minutes of play in our interactive adventure play frame where imaginations run wild! 30 minutes in our activity room with a leader and an organised activity, 30 minutes to eat their own packed lunch or we can provide lunch if required. We provide a safe, secure environment where children can play, develop and learn while most importantly, having FUN! All areas are furnished with padded mats for additional safety, and anti climb netting for a secure play environment. Entry and exit into the area is gained using electronically controlled access gates. Complimentary tea, coffee, bread and scones are available for teachers and leaders. Tailor made packages are available to cater for your own class needs. These can include face painting, craft activity, football tournament or dancing competition. So, why not book your trip now and look forward to a fun-filled day for the children and a stress free day for the adults. Fun filled afternoons with friendly, fully qualified staff. 10% Dicount available for siblings - just ask for details. Come along to Meet & Greet Marshall & Chase from Paw Patrol this Christmas at Gokidsgo! in Blanchardstown, Dublin 15. Monday Dec 24th: Decorate your own pancakes from 11am - 12.30pm with Marshall & Chase from Paw Patrol! See www.gokidsgo.ie or our facebook page for more info! Ho, ho, ho! Santa is flying down from the North Pole for his annual special visit to GoKidsGo! We know everyone has been good for goodness sake, so come get in the holiday spirit with us! Toddlers and Preschoolers (and their caregivers) are invited to celebrate with holiday stories, cookies, milk, and of course, Santa Claus! After stories are read children will have the opportunity to meet the jolly man in the red suit and get their picture snapped with him! Please bring your own camera for picture taking and join in this merry and bright event! Special Offer Wed Oct 31st come along to Gokidsgo! Blanchardstown for a fun filled Halloween Party from 10.30 to 3pm with Toddler Activities, Arts & Crafts, Sensory Play, Halloween fun & Games. Open from 9.30am - 6pm. €5 Admission all ages, any time of day for 90 minutes playtime. Call us on 01-6405500 for more info! It’s been a great summer!! Celebrate Back To School with us here @GoKidsGo! Special offer!! €5 Entry next Monday Aug 27th with a FREE Laser Tag Demo Game for children age 5+ from 2pm - 5pm! Summer Fun & Activities Every day! Meal Deal 🍟 with Entry only €10.00 per child. Come along this Saturday 17th March for a fun filled day @Gokidsgo! Kids can Meet & Greet Peppa Pig from 11am - 1pm. Join in the playtime, bubble fun and arts & Crafts with Peppa. Bring your camera for great photo opportunities! All children can get FREE St Patricks Day Facepaint and FREE Slushee to cool them down after all the playtime! All included in regular admission price - Happy St Patricks Day! HAPPY ST PATRICKS DAY from all at Gokidsgo! Excellent play centre. It's extremely spacious. Caters to all age groups. Staff very friendly and helpful. Lots of parking. Would recommend .